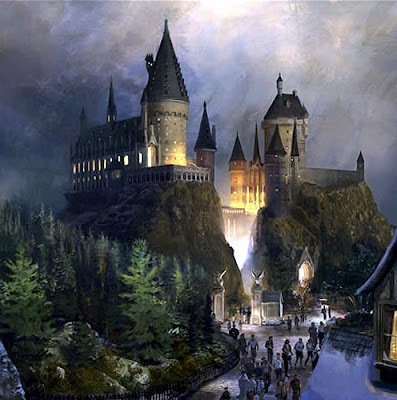 Is anyone else as excited as I am about the Harry Potter exhibit opening at Universal Studios in Florida this summer? Having read all of the books, it would be so darn cool to get up close and personal with Hogwart's Castle, The Leaky Cauldron, the talking picture frames, Dumbledore's office, Hagrid's hut, the sorting hat and a possible quidditch match. NO? I mean, when else would a Muggle get the opportunity? Here's a sneak peek video! I honestly can't wait! I live in Houston, Texas and my hubby and I have already planned on going next year it probably won't be until after the last two movies come out but I'm definitely excited!!!! I live in FL, not far from Orlando. I love love love Harry Potter and cannot wait to see the vivid descriptions of the books before my eyes! I'm so excited! 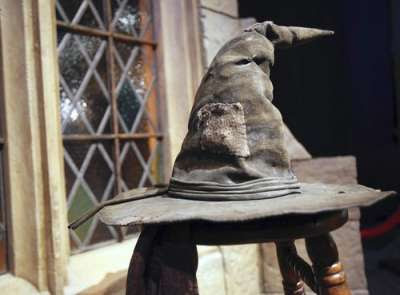 I want to wear that sorting hat! Can you imagine someone creating a theme park based on your books? The place does look cool! I'm not sure when or if we'll ever go there. We haven't even taken the kids to Disney land/world yet. Maybe one day. It's also at the Ontario Science Centre in Toronto. It looks quite cool. Plus the Weasley twins were there to open it. I am may excited the new movies are coming out in 2010 and 2011. When. That's what I need to know. I never got into the whole Harry Potter thing, but I love Universal Studios! I'm sure it's going to be AH-mazing!! I'm still a kid at heart...I can't wait to go there. Thanks for the photos. I hadn't seen any. Looks really cool. I didn't know they were making anything like this. Thanks for letting us know. Shhhhhhhhh.... Keep it down. My wife is both a Disney and Harry Potter NUT, so all she needs is another excuse to head back down there. We've been maybe a dozen times...OR MORE!! Super-fun. I went to the Harry Potter Exhibit at the Museum of Science and Industry in Chicago and it was fantastic!! I am so excited! Sadly, my kids are too little to enjoy it now, so while I'm close, we won't be going. Such a shame! Oh, I TOTALLY want to go! Forget taking the kids- DH and I want to go by ourselves! So cool. I would love to go it my 6 and 3 year old weren't affraid of the Harry Potter movies. I've only seen one of the movies. I don't know much about Harry! Oh wow - i'm not sure how many times I've read the books now. I would LOVE this. It would be.... wow.